On paper, Outward sounds like a game-changer. Equal parts epic fantasy RPG and open-world survival game, Nine Dots’ adventure manages to marry some wonderful new ideas with tried and true conventions, but the result is decidedly hit and miss. It begins with you waking on the shore after a shipwreck that cost the lives of a bunch of people you never learn about, and a small fortune – a fortune with which your created character intended to use to pay off their family’s blood debt. With no money or prospects, you’re begrudgingly given 5 days to raise the money you need or lose everything. As opening motivators go, it’s decent, and for once it’s nice to have a real reason to go out into the world with nothing. We’ll, next to nothing. At the very heart of Outward is an ethos borrowed wholesale from the Boy Scouts: be prepared. Resolving to head out into the wide world beyond their fishing village to seek fortune and adventure, your character must first ensure they have everything they need to brave the world. You’ll need a weapon of some sort, a waterskin to stave off that thirst meter, and a backpack. All are important, but it’s the backpack that will serve you truest. Initially, Outward is incredibly hard, though not only be design. Combat is horrifically janky, to the point where you can’t tell who’s damaging who as you and an enemy kind of ice-skate round one another. It’s a standard set-up of light and heavy attacks, a dodge roll and a block, but it feels imprecise. You can assign special moves to the triggers and face buttons, but they have meaty cooldowns and very little is fully explained unless you want to put yourself through an incredibly dull tutorial. I did struggle with the AI, too, as sometimes an enemy will do nothing at all even though you’re two feet away, whereas sometimes they’ll somehow spot you from across a map. And when they do spot you, almost every single on is defaulted to charge and attack. There’s little nuance to any of it, and in the end the combat turned out to be the element I disliked the most. Which is a shame, because there’s lots of it. You’ll outfit your character mostly through crafting and looting, as each settlement has a number of artisans, some of which can train you. 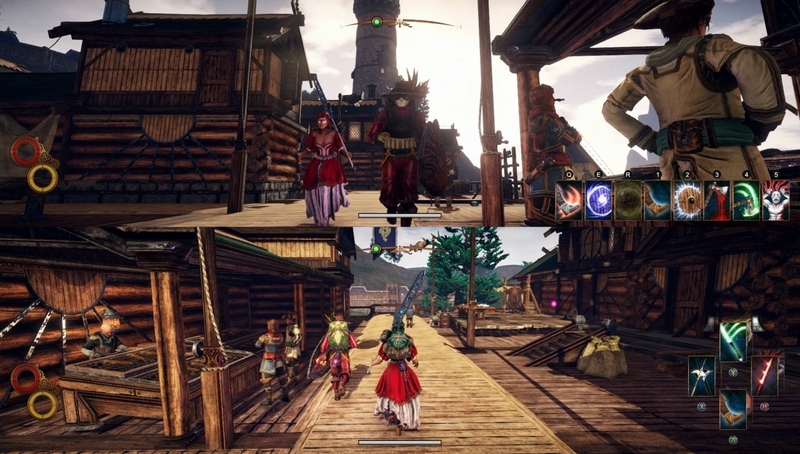 Likewise, you can learn new combat arts and attacks from warriors and trainers you’ll meet along the way. Sadly, though, even later in the game, combat remains a bit flat and lifeless, but it’s what happens if you lose that’s interesting. If you happen to die, which is pretty hard to do, you won’t respawn. Instead you’ll need to make a new character who will inherit the old character’s gear like Zombi, and start afresh. However, you’re more likely to be knocked unconscious and wake up back in the village, or find yourself imprisoned by the enemy, in which case you need to escape. 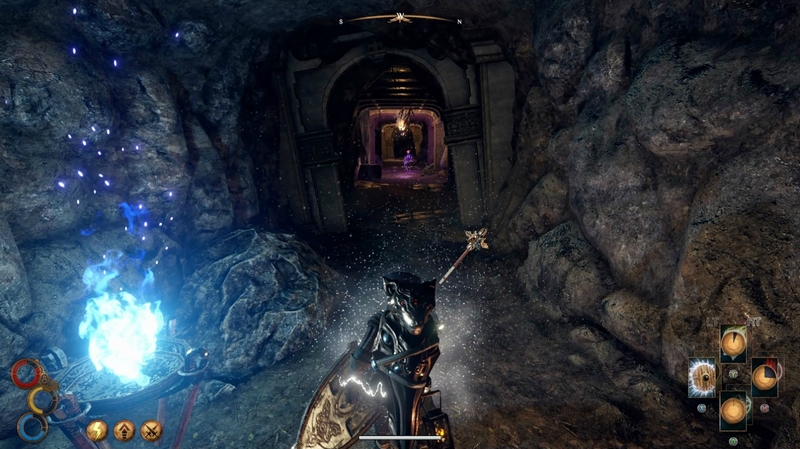 I found this to be one of the coolest and most intriguing features of the whole Outward experience, because it somehow feels more real than just dying and respawning or continuing from a checkpoint. Having to sneak around to locate your precious pack is surprisingly tense, at least the first few times. In fact, you’ll find that you become ridiculously attached to your pack, even when you’ve upgraded it several times. In a neat little addition, you can hit Up on the D-pad to shrug it off, relieving you of its weight and giving you more manoeuvrability in a fight. Just don’t forget it when you’re done! The magic system is another interesting facet. While I played almost primarily as a swordsman/archer, I dabbled in the magic and what I saw was intriguing. Most offensive spells require a primer and a catalyst. For example a fireball requires you to summon the power of fire first by laying down a hex on the immediate area, before using a Spark spell to ignite it and deal damage to the enemy. These elemental primers come in the standard flavours, but since all have to be assigned to your limited slots along with the catalysts, which forces you only equip the best spells for a given situation. The more complex spells later on require more complex rituals, and the combination of elements and catalysts. It’s refreshing to not just be able to whip out a fireball willy-nilly and keep everything hot-keyed like Skyrim. Outward, once again, impresses upon you the need to be prepared. Once you venture beyond the borders of the starting area, there’s a wonderfully procedural feel to everything. Random bandits and animal attacks, the NPCs you meet and how you deal with them, where you’ll be whisked off to when you lose a fight or where you’ll have to reluctantly and nervously set up camp for the night and what you’ll eat before you sleep – all these things combine out in the wide world to create a rewarding experience that’s worth much more than its iffy looks or janky combat. Because it does look a bit iffy at times. The character models in particular aren’t great, while enemy design is pretty basic and the textures, on Xbox One X, at least, aren’t overly detailed. The vistas themselves look decent enough, and there’s just enough draw distance to make you want to explore that near horizon, but some of it looks decidedly last-gen. Also, the UI isn’t great, with an inventory screen that doesn’t make it easy to tell what you’re even wearing or wielding, and a poor map that actively works against plotting any kind of route from A to B. But what Outward offers is a whole world to explore. The freedom to build the class you choose, to learn the skills that interest you, to fend for yourself in a harsh environment. There’s an undeniable sense of scale that pulls you on, that makes the (admittedly, very lenient) welfare management seem worth the effort. What’s more is that you can play the entire adventure with a friend, exploring the rolling hills, broiling deserts and dense forests together. And you never lose that sense of vastness, even when tackling it beside a friend either online or, brilliantly, in couch co-op. 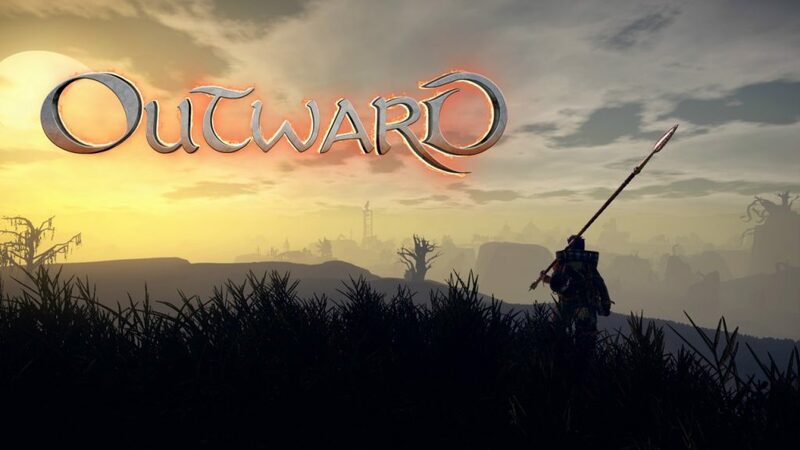 It’s easy to criticise Outward for its looks and combat, or to pull it up short for its failures, but almost everything wrong with it is a direct result of Nine Dots taking incredible risks to produce a truly ambitious passion project that, in all fairness, just about gets more right than wrong. 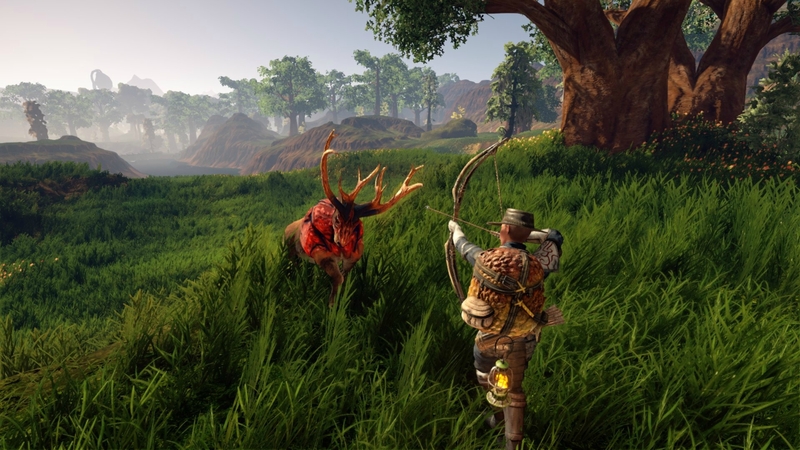 If you’re a fan of survival games and you’ve been put off by Outward’s fantasy setting, don’t be. If you can look past what’s skin-deep and come to terms with the combat for what it is, you’ll find the foraging, crafting, striving survival sim you’re looking for.